After the recent trip to Ljubljana to test the racket accuracy we have our results, and they’re fantastic! In the image above we see a top down view of the court with a player doing some shots from all different areas of the court in a typical rally pattern. The black dotted lines are the actual position of the racket (accurate to less than 1 mm), and the solid coloured lines are the position generated from the sensor. As you can see we have some drift on some segments – we’ll be working now to improve the algorithms used in the sensor – but overall this is a great result. The average absolute position accuracy at the point of strike is approximately 35 cm, and we believe we can get this down to less than 30 cm. In places where we are out, we still keep the general shape of the motion, we are just shifted in space somewhat (generally left to right error). Pretty good considering the sensor costs £150 and needs no calibration or setup, whereas the motion capture system costs hundreds of thousands and takes days to set up. Plus we track the racket at 1000 times a second – accurate enough to see every detail of the swing and strike, wheres the motion capture was limited to 180 times a second. 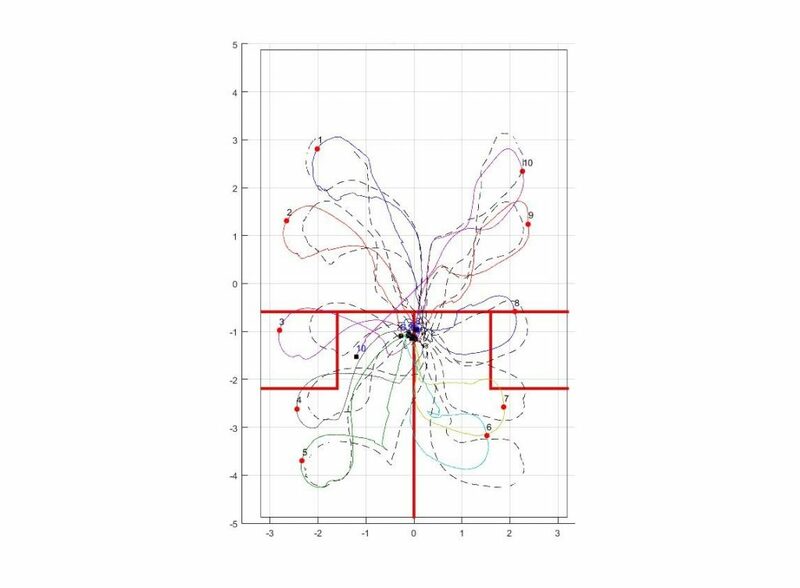 Our goal is to make this accurate enough to classify the specifics of the shot being played (drop, drive, boast, lob, etc) based on the player’s position, and the orientation and velocity of the racket face at the point of strike. Also to be able to do a heat map of the players position and dominance of the tee etc.